The included formats are 3DS MAX 2016 with V RAY renderer and Blender with Cycles render engine, too there are OBJ and FBX formats where only the geometries are included. All textures are equal to or greater than 16K (16384 x 8192) and can reach 23K (23040 x 11520). 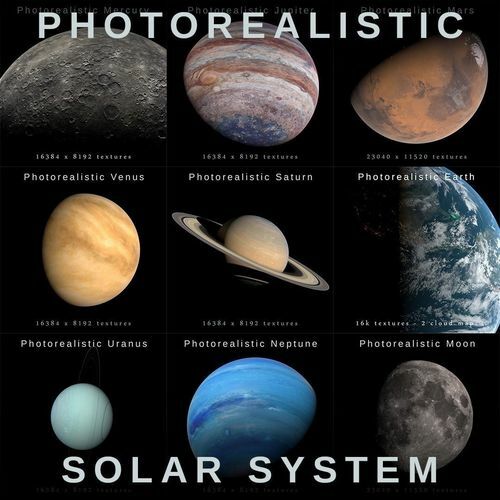 Many of these textures have been created artistically, and others have been modified from the from NASA images, and from other sources, to get the best possible result. The eight planets that make up the solar system, the moon and the sun are included in the collection. All of them they have a correct axial tilt and oblateness in accordance with the real ones. All files are constantly updated, so once you have purchased them you have access to all improvements and updates that appear. Sun (16384 x 8192) textures. Mercury (16384 x 8192) textures. Venus (16384 x 8192) textures. Earth (16384 x 8192) textures. Moon (23040 x 11520) textures. Mars (23040 x 11520) textures. Jupiter (16384 x 8192) textures. Saturn (16384 x 8192) textures. Uranus (16384 x 8192) textures. Neptune (16384 x 8192) textures. Don't forget link the textures in the materials!